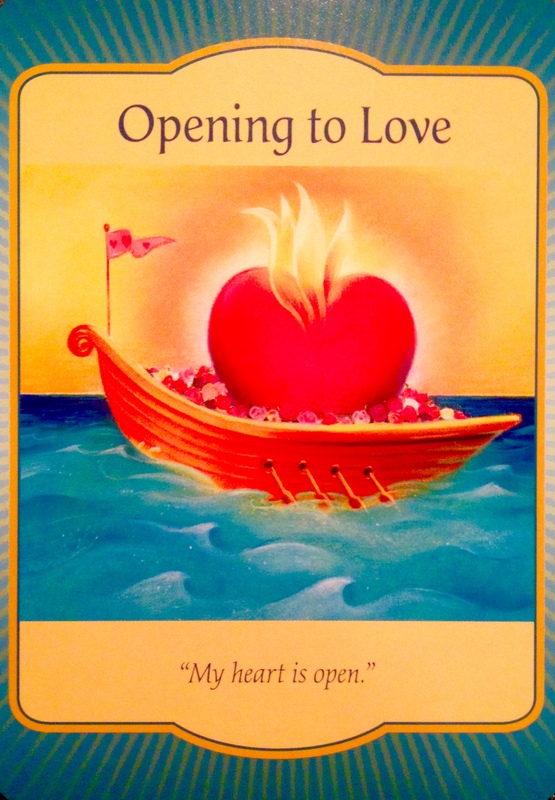 Card meaning: Love is on its way. The more you open to love, the more its sweet nectar can surge through your soul. From the love of others, to the love of self, to love from the Creator, love flows to and through you. You are indeed a scared vessel for love to flow through. The Universe wants you to know: There is nothing you need to do to deserve love. It is already waiting for you. It is like the sun… there for everyone. It is simply a matter of stepping out to bask in that warm and glowing light. Who you are is enough. This is true. In matters of romance, love is flowing, wounds are healing, and hearts are opening. If only you could see yourself as those in spirit see you, you would know how very loved you truly are. Angels are an expression of the Light and Love of the Universe. They are, in effect, pure love energy. And each and every one of us has angels around us. There are always there. These angels love us beyond anything we can comprehend or possibly imagine. And they come to us for a reason. They come to us to embrace us with their light, and to help us to experience the pure Divine Unconditional Love. Christ Consciousness Love. Yet to us, it comes as a whisper on the wind; a longing for a feeling; a hint that sparks the desire for more. We reach for it, and yet as we fail to grasp it we look to the physical material world to fill the void. If only we would look within; there lies the connection; there lies the very same Light and Love. Love will save the planet. Love will ascend us together as a whole. Opening our hearts to embrace every aspect of the living world, every creature, every plant, every being and Mother Gaia herself with the pure, unconditional love that resides within every single one of us. All we must do is open our hearts, open ourselves to see the beautiful Light and Love within All That Is. Open ourselves to be vessels of this healing and fulfilling Love. We must learn to reach through ourselves, past our egos and into the Divinity that is Divine Life itself. We must learn to see the abundance of miracles which surround us each and every day. Know that the key to the Universal creation of miracles are natural yet profound. They reside in the sunsets, in the oceans, the Stars, the rainbows the flowers and the trees. They are the simplest and yet most awe inspiring moments of our lives, and they are available to us whenever we stand still… opening up and loving enough to receive them. Let gratitude lead the way.